Water buffalo are now part of the Comox Valley agricultural scene, thanks to McClintock’s Farm. troche acclaimed horse trainer and show rider Martha Crawford Cantarini was among the busiest of Hollywood’s elite corps of female stunt riders. Above, ed Cantarini was taking publicity photos for the Western ‘The Big Country’, injection starring Gregory Peck and Charlton Heston, when the horse caught his leg and fell. She stepped off in mid air and pulled him away from the wheel. ” src=”http://www.infocusmagazine.ca/wp-content/uploads/2013/06/00-Martha-and-Jim-web-602×592.jpg” width=”602″ height=”592″ /> In the 1940s and 1950s, acclaimed horse trainer and show rider Martha Crawford Cantarini was among the busiest of Hollywood’s elite corps of female stunt riders. Above, Cantarini was taking publicity photos for the Western ‘The Big Country’, starring Gregory Peck and Charlton Heston, when the horse caught his leg and fell. She stepped off in mid air and pulled him away from the wheel. Photo courtesy Martha Crawford Cantarini. There’s plenty you could ask Martha Crawford Cantarini about, with a guarantee of hearing a stream of entertaining stories ranging from glamorous to gritty. You could ask her about her career as one of Hollywood’s first female stunt riders, working alongside stars like Claudette Colbert, Elvis Presley and Clark Gable. Or about growing up as the stepdaughter of Carl Crawford, who managed one of Los Angeles’ most elite polo stables and hobnobbed with the likes of Spencer Tracey and Gregory Peck. Or about her celebrity horse Frosty, who performed in Las Vegas and had his own TV show; about life on the racetrack circuit with her jockey husband, John Cantarini; and about becoming, in her 80s, the author of the memoir Fall Girl: My Life as Western Stunt Double. But that’s not what most people ask her about, she says with a slightly exasperated laugh. Their life changed radically 12 years later when a car accident put a sudden end to John’s racing career. The silver lining was the freedom to move to BC. They didn’t know where on the coast to settle, so they just rented a travel trailer and headed out. And so they did. But their four years on the Island were marked by the death of Martha’s mother and by the challenges of adapting to John’s post-accident limitations. Feeling in need of a fresh start, they moved to the Okanagan. But they stayed in touch with a friend they made on Denman: Joy Lance, a home-care provider who had become intimate with the family while providing palliative care for Martha’s mother. Lance became the Cantarinis’ adopted daughter. So in early 2011, when John’s health took a downturn, Lance told them, “It’s time to come back to Denman.” She converted an old garage on her property into a home for them, and since then they’ve been very happily living on this small island, although Nelson Eddie hasn’t yet ridden up in a red suit. 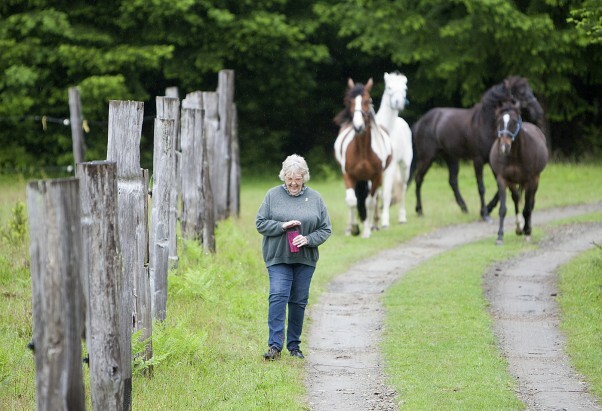 “There’s another dimension you get into when you’re with horses,” says Martha Crawford Cantarini, now living on Denman Island. “There’s a bond.” Photo by Boomer Jerritt. Martha’s colorful history is a bit of a secret on Denman Island. It was only a couple of months ago that the Island’s library got a hold of Fall Girl for its local author’s shelf. This book is packed with the stories Martha most loves to tell, starting with her early days growing up surrounded by horses—and movie stars. Born in San Antonio, Texas in 1928, Martha moved to Santa Monica, California at the age of seven with her mother and stepfather, a professional polo player. Her stepfather taught her to ride when she was three years old and she grew up riding at polo clubs in Chicago, New York and California. In the 1940s many of the big stars played polo, and Martha’s stepdad managed one of the biggest polo stables in California. For Martha, Hollywood glamour was the bread and butter of daily life. “Those famous people were just my parents’ friends to me. Shirley Temple was just another girl in my riding group. I was never enamoured of the whole movie-star thing,” she says. She loved hanging out at her stepdad’s stables, but not for the stars. It was the horses that drew her. “What I liked best were the days my dad drove me to school, because he’d sneak me off to the stables instead. We never told my mother! She was a real glamour girl and wanted me to be a starlet,” says Martha. Her mother’s ambitions for Martha crystallized when she was in her late teens. “My dad was good friends with Darryl Zanuck, who was the head of 20th Century Fox Studios and also a polo player, and he set up a screen test for me. But my heart wasn’t in it. I did not want to be a starlet. I had a secret plan, in collusion with my dad,” she says. The screen test did not go well, as Martha had suspected (a young unknown named Marilyn Monroe, who tested on the same day, had more success). “It was a flop. Ben Lyon, the head of casting at 20th, was sweating it out about how to tell my dad I was no good.” Martha, who as a Hollywood insider knew what projects were in the works, suggested to Lyon that he give her a Screen Actors Guild card and let her double Anne Baxter in the upcoming movie, Yellow Sky. “That worked. I had what I wanted, Ben Lyon was relieved, and Zanuck had Marilyn Monroe.” And her mom had to be content to have a daughter in the film industry—but not as a starlet. Martha was one of just 12 women doing horse stunt-work in the Hollywood movie industry during the 1940s and ‘50s. She was the regular stunt double for such actresses as Eleanor Parker, Anne Baxter and Shirley MacLaine, appearing in films ranging from Elvis Presley’s debut feature Love Me Tender, to the epic Western, The Big Country. She can remember every stunt she did. “I have a few favorites,” she says. “There was one in Interrupted Melody (1955, starring Glenn Ford and Eleanor Parker). We trained a horse for three solid weeks to jump into a fake fire. They spent $50,000 on that scene—it was the most expensive indoor scene ever filmed at that time. There was an article about it afterwards in Life Magazine. 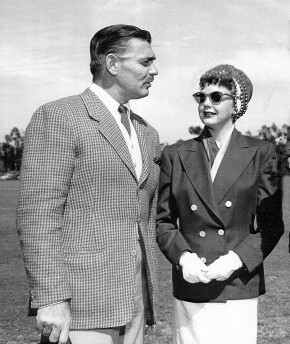 Martha Crawford Cantarini and Clark Gable, taken before presenting a trophy at a polo match at the Beverly Hills Polo Club. They worked together several years later in ‘The King and Four Queens’, when Cantarini stunt-doubled for Eleanor Parker. Photo courtesy Martha Crawford Cantarini. And in spite of her claims not be bedazzled by stars, she says, with a twinkle in her eye, that she has “never recovered” from the day Elvis winked at her on the set of Let Me, and she treasures the memory of striking up a friendship with him while filming Love Me Tender, a friendship centred around daily talks about their common interest, horses. And horses, above all, were what she loved best about her work. “There’s another dimension you can get into when you’re with horses. There’s a bond. I can’t really explain it, but it’s an incredibly strong feeling. If I had problems, whatever they were back then, I’d go spend the night in the stall. As a whole, girls have this rapport more often than men, I don’t know why,” she says. But girls were not as often found in rough and tumble fields like stunt doubling. As a woman doing physically challenging work in a male-dominated environment, Martha sometimes encountered what today we might call gender discrimination. She remembers one movie where she was blocked from riding in a scene where she’d play someone who is killed falling off his horse. But generally, she says, if you were good at your job, you got work. Martha’s stunt-riding days came to an end with the rise of made-for-TV Westerns, which were shot with a smaller budget and with less time to set up challenging shots. “Instead of six horses pulling a wagon there’d be two. Instead of showing someone falling off a horse, they’d show someone on a horse getting shot, then cut to show them on the ground. So there was less work,” she says. But Martha was still able to keep her life centred around the combination of horses and showbiz. She had a very special horse, a palomino named Frosty. Frosty was an orphan she had rescued from a racing stable, where he’d been considered a worthless runt. She’d recognized a certain something in his eyes that convinced her he had unusual intelligence and the spirit of a champion, and worked painstakingly with him, turning the skinny runt into a beautiful, athletic horse with excellent training. Martha had this idea he could be a star, maybe by breaking into TV commercials, but wasn’t sure how to make this happen. And yet, much like her stunt riding career, it did happen, as a side effect of a completely different endeavour. “The acquisition of my new Ford station wagon launched Frosty’s professional career,” Martha remembers. While waiting at the car dealership, she chatted to all who would listen about her horse and his potential for promotional work. “I noticed a door into an adjoining office was ajar. Suddenly, it opened with a rush as a gentleman hurried out wearing a smile that suggested he had just discovered gold.” He was the dealership’s owner, and by the time Cantarini drove out with her new Ford, they had a plan hatched to feature Frosty in the car lot’s advertising. From there, Frosty went on to star in a variety of TV commercials and eventually landed his own show, Frosty’s Farm Club, which ran for 10 years. Frosty’s career peaked when he was invited to perform live at the Thunderbird Casino in Las Vegas, where he danced around the tables and slot machines and, using a trick Cantarini had taught him, threw the dice with his mouth—rolling a lucky seven. 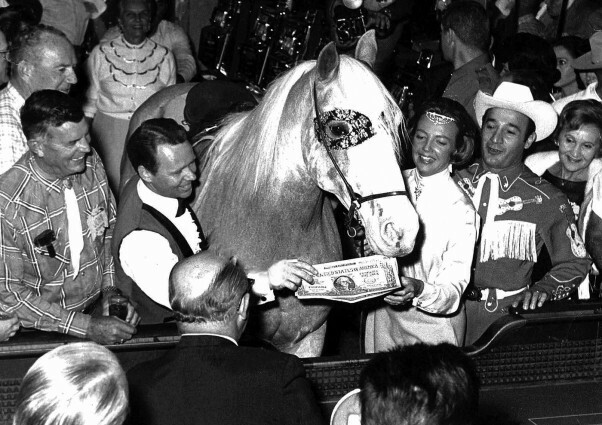 Frosty and Cantarini at the Thunderbird Hotel and Casino on the Las Vegas strip, taken just after the horse rolled a lucky seven and almost caused a riot in the casino as people wanted to touch him for luck. Photo courtesy Martha Crawford Cantarini. It was during the Frosty days that Martha met her husband, John. Not surprisingly, it was a horse that brought them together. A jockey, he rode a horse she owned in a race, and afterwards she was waiting to congratulate him—even though the horse had come in fifth. “I thought, ‘Who is this dizzy woman—no one has ever congratulated me for being beat before,’” says John. What he didn’t know is that Martha had bought the race horse knowing it wasn’t a good runner and hoping to turn it into a jumper. It was the horse’s trainer who had the idea to run him under leading jockey John Cantarini, thinking they might do well enough to cover Martha’s costs. He was wrong—but Martha did end up with a prize. “We went out for dinner that night…and that was that,” says John. As Frosty’s show-business career wound down, John’s racing became the focus of the Cantarinis’ life and the couple travelled from track to track on the North American circuit. John’s1983 car accident put an end to this and led down the path that brought them to their current home on Denman Island. In 2004, Martha was inducted into the Stuntmen’s Hall of Fame and, the following year, was awarded a Motion Picture TV’s Golden Boot Award for Lifetime Achievement (the Golden Boot Awards are dedicated to the world of Westerns). Film legend Jean Simmons presented Martha with her award. Winning this award gave her the impetus to sit down and write a book about her days in Hollywood. The process from starting to write to getting published took five years, and involved developing a productive relationship with a co-author, Chrystopher J. Spicer. Martha has been spending much of her time writing another book, the story of Frosty. As she approaches her 85th birthday, she is still following the theme of her life—horses and stories, now through the medium of print, rather than film or TV. Although she’s happy to explain to anyone how she ended up on Denman Island, most of all she loves to tell people about her adventures with horses and the entertainment industry. “Horses are the unsung heroes of Western films,” she says. Thanks to Martha’s storytelling, some of these four-legged stars are getting their due. Martha’s book is available locally at South Country Feeds in Courtenay. In 2010, Sandra McClintock had decided it was time to make some serious decisions about her future. A fourth generation Comox Valley farmer, she was no stranger to the agricultural industry but she thought, perhaps, it might be interesting to develop a business that produced value-added products. It was time for a change, and for her to personally invest her energy into the 78-acre family-owned and operated heritage farm in Dove Creek. This would give her the opportunity to live and work alongside her father, Gerry, and mother, Val at McClintock’s Farm. She was seriously considering life as a cheese or yogurt maker when, out of the blue, her business coach and advisor, Gary Rolston, suggested a water buffalo dairy. It wasn’t long before she decided that, instead of learning how to make cheese, she would take the advice of her business coach and start a water buffalo dairy that produced the milk so someone else could make specialty cheese! As McClintock affectionately reaches out to scratch the forehead of a rambunctious little water buffalo heifer named Annie—one of the first 15 calves born on the farm since last spring, all with names that start with the letter ‘A’—it is easy to see she has made the right decision. With their flat black noses, floppy ears, gentle brown eyes and amiable dispositions, the water buffalo babies are easy to grow fond of. McClintock’s first step was to secure a buyer for the milk that would be produced. All of it is sold to Natural Pastures Cheese in Courtenay. Then, after some number crunching and careful cost analysis, she installed a milking parlor that can accommodate eight cows at a time, making a few adaptations to retrofit it for water buffalo. Then, in the fall of 2010, she took delivery of 15 water buffalo heifers from Fairburn Farm in Duncan, BC, and a bull from the Ontario Water Buffalo Company in Stirling, Ontario. After the first calves were born, she started milking the buffalo on March 8, 2012, which was only about a month after her daughter Carla was born. McClintock says, rather nonchalantly, that she has not missed a milking or had a single day off since then. Surprisingly, instead of looking exhausted, like one would expect of a new mom and dairymaid to this unique herd, McClintock appears elated. Clearly, this woman is no stranger to hard work and she loves her life on the farm. Today, there are only two beef cattle left on McClintock’s farm and the water buffalo herd—which grazes free range on the farm’s lush pastures—has grown to more than 30. This includes the female calves that were born on the farm, as well as 11 pregnant heifers that are being leased from another farmer. Twenty-six more calves are expected in the coming months. As planned, this new business enterprise remains a family affair, along with the large and well-established ‘U-pick’ blueberry and raspberry fields and award-winning sweet corn that McClintock’s Farm is known for. The biggest corncobs are sold at the weekly Farmers Market in the fall and the smaller cobs are chopped into silage and fed to the livestock over the winter months. Sandra McClintock is responsible for animal health, milking and breeding. Her father, Gerry, ensures that all of the equipment is in good working order and maintains his role as the crop specialist, ensuring that the berries, corn, and other crops are growing well. Her mother, Val, looks after customer relations, yard maintenance and the day-to-day running of the farm. Fourteen-month-old baby Carla is busy growing up. According to McClintock, there are unique challenges to managing water buffalo, as compared to a traditional dairy herd. While the animals are quiet, easy-going and predictable, they do best with routine and they dislike change. As a result, it can be harder to get them to ‘let their milk down’, especially if someone else comes into the milking parlor. Overall, they are hardier than dairy cows and require little help from their caretakers when it comes time for the babies to be born. They are also longer-lived, and can continue to produce milk well into their 20s. Despite their rarity in North America, water buffalo have been domesticated for thousands of years in Asia and Europe. They have been traditionally used as draft animals and raised for both their milk and meat. While there are some wild water buffalo in various parts of the world, they are a different species. The first water buffalo were brought to North America in 1976. According to the American Water Buffalo Association, there are only about 4,000 water buffalo in the USA. Surprisingly, a large percentage of Canada’s small water buffalo population is on Vancouver Island. 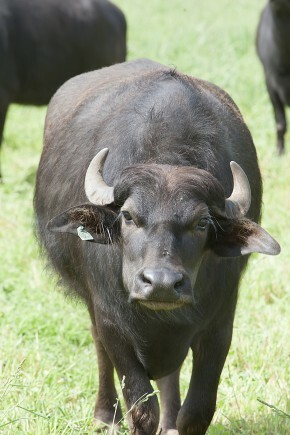 McClintock’s Farm is one of only three domesticated Asian water buffalo dairies in BC. One in Duncan started in 2006, and another one in Port Alberni started just recently. Island Bison Farm in Black Creek is working in cooperation with two of the dairies to buy their bull calves and now has 23 water buffalo, in addition to dozens of American bison, which are being raised for meat. Water buffalo are to Asia what bison were to the American plains Indians. For millennia, water buffalo provided draft power, milk, meat, hides, horn and fuel in parts of Asia where no other sources existed. They are still an integral part of rural life in Vietnam, Cambodia and the rest of Southeast Asia. They are intelligent animals with a placid nature and they thrive with human interaction. Often referred to as the ‘living tractors’ of Southeast Asia, water buffalo have massive frames supported by stocky short legs and large cloven hooves that are perfect for navigating flooded rice paddies. Their rotund and well-muscled bodies are a sharp contrast to the angular and boney structure of the modern-day dairy cow. There are two main types of water buffalo—river and swamp. Despite having slightly different chromosomes, the two distinct types can be interbred with each other but cannot be successfully bred to domesticated cattle, American bison, Cape buffalo or yaks. Many of North America’s water buffalo are a combination of the two types. Fully-grown adults can range from 800 to 2,000 pounds and measure 40 to 60 inches tall (at the withers). Both males (bulls) and females (cows) have long, slightly curled horns and black tongues. As their name suggests, they love to swim in water and wallow in mud. Water buffalo calves have very thick, shaggy hair when young, while the adults have relatively sleek coats that range in color from black to light brown or gray. This variance in coat thickness is related to the fact that water buffalo have one-tenth the number of sweat glands of domesticated cattle and correspondingly sparse coats. They are born with all of the hair follicles they will ever have so, once the hair falls out, it doesn’t grow back. Doug Smith from Natural Pastures Cheese says that water buffalo milk is prized for its flavor and texture and that it is much different than cows’ milk. It is higher in fat, protein, calcium and minerals and is an all around very, very rich milk… making it ideal for processing into fine cheese. Natural Pastures produces two authentic Italian water buffalo cheeses based on centuries-old recipes: Mozzarela di Bufala and Bocconcini di Bufala. They buy all of the water buffalo milk produced from the Island’s three water buffalo dairies and distribute the cheese throughout Vancouver Island and to several distributors in the western provinces. While milk is an obvious byproduct of a water buffalo dairy, meat is the second part of the agricultural equation. Water buffalo meat is said to be lean and tasty, containing less than one-fourth the amount of fat and half the cholesterol of beef. Cooked, it closely resembles and tastes like lightly marbled beef. McClintock says that the females are far too rare and expensive to butcher—to buy a young heifer is about $3,500 plus transportation costs. But, obviously, something needs to be done with the bull calves that are born every year. Each dairy farm can only realistically have one or two bulls. This is where Marc Vance from Island Bison, enters the picture. He buys the water buffalo bull calves and his four children, ranging in age from six to 16, have taken on the project of bottle-feeding all of the buffalo babies that come to their farm. The oldest water buffalo at Island Bison are now about nine months old and the Vance kids play with them and even ride them! 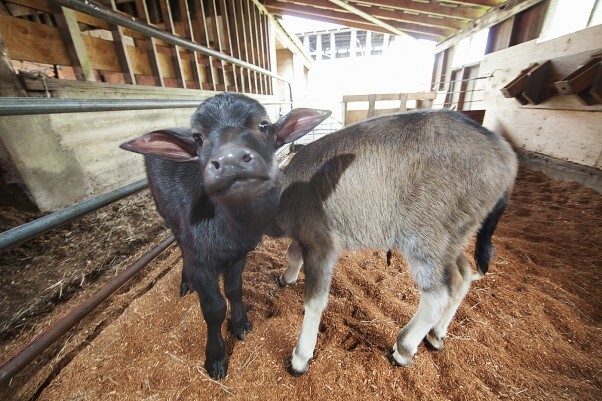 The first two water buffalo calves acquired by the Vance family were named Oliver and Walter. The plan is that they will never be sold for meat but will, instead, be trained to pull carts. Vance reports that Oliver has been doing a good job pulling a cart already—much to the delight of farm visitors and the family. Whether it is water buffalo meat or milk, this new agricultural venture is truly unique and is a testament to the ingenuity and drive of the men and women who work behind the scenes in the ever-evolving farming industry in the Comox Valley. In the coming years, McClintock hopes to build her herd to 40 milking cows and she is happy to be working with water buffalo rather than learning how to make cheese and market products. Sign up to get on the InFocus list for future email notifications.